If you are new to Chinese medicine you probably have questions. Here we try to address what you can expect from your first treatment, and other common questions. A new patient visit is typically about 90 minutes long. We spend more time talking at the first visit to get a good sense of your current state of health, your medical history, and your specific health goals. Chinese medicine is a holistic medicine, meaning that we care about all aspects of your well being. For example, if you’re coming in for chronic back pain, we will still ask about how your digestion is going, how you’re sleeping, and your overall energy level. You may be surprised to learn how these things are all connected. This approach helps us to achieve a thorough diagnosis and treatment plan that addresses all of your concerns. Chinese medicine utilizes pulse and tongue diagnosis, which involve the very gentle palpation of the radial pulse, and briefly examining a patient’s tongue for relevant information. It sounds a little weird, but we assure you, most patients find it relaxing and painless. When we have determined a treatment approach for your visit, we will give you a brief explanation before beginning any treatment. You are always free to accept, or decline any portion of the proposed treatment. 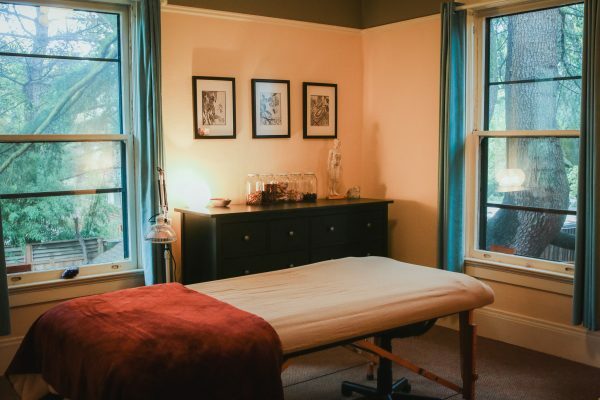 Treatments typically involve some combination of acupuncture, cupping, guasha, and gentle bodywork, as well as going over any herbal prescriptions and lifestyle recommendations. For patients who have trouble tolerating needles, we have many gentle techniques to work with, some that don’t involve any needles at all. The treatment is almost always performed mostly clothed, and if for example we are working on a large portion of the leg, abdomen, or back, we use draping just like a massage therapist would to keep you adequately covered. At the end of your treatment we will chat briefly chat about how your treatment went and what we recommend in terms of follow up and at home self-care suggestions. We will provide follow up recommendations, and an overview of our treatment planning process at the end of the first visit, or within 24 hours after your appointment.